Garrett's new pulse induction ATX metal detector is the ultimate multi-frequency detector for all terrains and extreme conditions (highly mineralized ground, saltwater, etc.). It features advanced pulse induction technology, a durable design that meets military specifications, and an advanced 20 inch Deepseeker searchcoil is ideal for use in searching for caches and other deeply buried large objects. The ATX is waterproof to 10 feet, and ground balances to saltwater without requiring a special mode or use of discrimination! The ATX detector is highly recommended for Gold Prospecting, Deeply Buried Cache Hunting, Relic Hunting, Dry Beach/Fresh Water Hunting, and Surf Hunting. Is also good for Jewelry Hunting, Coin Hunting and Ghost Town Hunting. Download the field test review here (.pdf) that appeared in the Nov/Dec 2014 issue of Gold Prospectors Magazine. PI (pulse induction) detectors work a bit differently than the more common VLF (very low frequency) detectors by putting magnetic field energy into the ground and then switching off and waiting a short period before they start to look for a response. This makes them better at handling ground mineralization than a VLF detector because during that short delay the magnetic response of iron trash minerals that you don't want to find dies out. VLF detectors do not as easily cancel out ground mineralization the way a PI metal detector can do. The most popular use for a PI machine is detecting on the beach. Saltwater in sand gives many machines real problems with stability. The ATX performs well, and is stable in challenging conditions. The Garrett ATX is an impressive machine, extremely well built. It folds down to easily fit in a backpack. 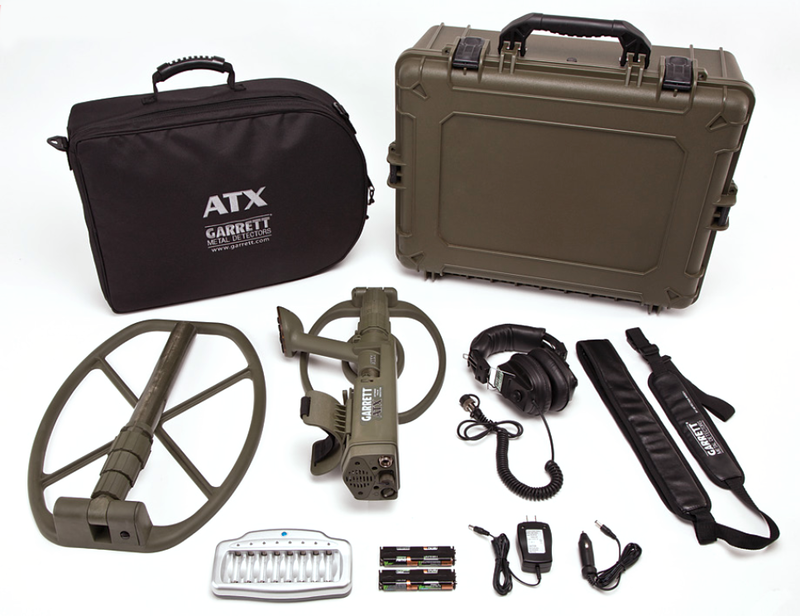 If you don't need the Deepseeker Pack, click here for Garrett ATX Basic Pack instead.